I’d like to have an automatic privacy zone, e.g. around my home address, friends’/family members’, so that I don’t have to check whether I’ve remembered to mark all my observations every time. There should be an option to edit individual observations and manually mark as public, if desired. With an off option please. I incorporated it into the request. Yes, I’d like this automatic geoprivacy too. with an easy way to retrospectively add it! This is a great idea! 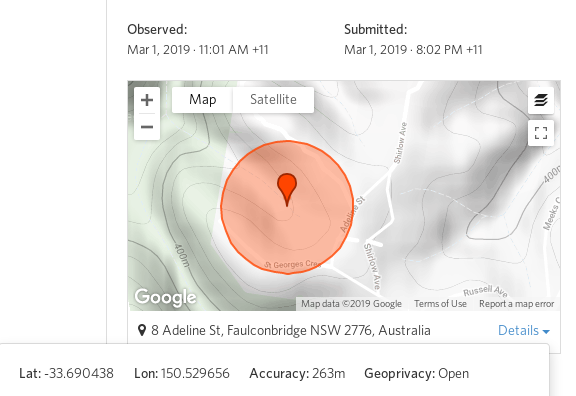 It always bugs me that I have to remember to hit the obscured geoprivacy setting when submitting observations near my house. Obviously not a big problem, but it would be nice if there was an easy solution. One could even take it a step further and allow a creation of a privately visible ‘Home’ place (or maybe several) which would not only auto obscure, but also make a special ‘home species list’ and show some special stats too, and make it easier to share them on social media (without revealing location) or show them in a profile). Help get people excited about the biodiversity in their own backyard - what’s not to like! I currently do this with manual obscuring and a traditional project but a ‘home’ space would be way better. Agreed. I am moving, so I recently used the batch edit function to set the geoprivacy to ‘open’ on the observations around my home. It was clunky but worked. I would rather just be able to move the geoprivacy fence location and perimeter size and let iNat obscure what falls inside. when you upload an observation made in that area, it automatically is obscured or made private (whatever you’ve set it to do) upon creation, but you can change the geoprivacy afterward. Obviously not exactly what everyone wants, but should solve the problem about a home place. Would it be possible to have this act as a secret place/location filter as well? I would like to be able to see my “yard list” but not have to make a public place to collect the observations. I’ll see if this is possible, that’s a good suggestion. Yeah it would be awesome to be able to have a yard list. I’m hoping it can be at least an acre and a half in size since that’s our land. We are pretty rural so I know it’s larger than average. But I don’t really know how big sports fields are… not a sports guy. What I would prefer instead of obscuring, would be to change the location to a random spot somewhere, say, 1 km away, then change the accuracy to, say, 2 km. By comparison, obscured locations can cover a range of hundreds of square kilometres. Hmm, on other Discourse forums posting an image URL will display it automatically (saves on server costs). On this site you need to use this format: [<img src='/uploads/inaturalist/original/2X/0/0377ecdae93c00a7200a0621c1ed72455fe4f93f.png' alt='https://imgur.com/VegVtvA.png'>](https://imgur.com/VegVtvA.png). Edit: then the system goes and downloads local copies of the images and edits my comment with a local link. So much for trying to save on server costs! What if someone is fortunate enough to own property of that size (or bigger)? My impression is this could be a compromise or “easy implement” option, so there may be potential to re-address it down the track? in vermont (which is rural but iNat is very popular) many users live on a few acres. I guess i am not sure how that translates globally - what the median and mean property size is (including renters) but i do want to subtly remind the devs that a lot of people don’t live in big cities and do have interest in a larger 'home ’ parcel. I wouldn’t see any reason to limit it to such a small size (more than say 5 acres) unless there is a compelling coding-side reason to do so, and in any event if it’s smaller than maybe 2 acres (to have a buffer to account for GPS precision and such) i probably won’t use it and i imagine many others in Vermont also would not. In rural upstate NY, same deal. Modest small home with some acreage. My previous suggestion I posted about on the Google Group was to just save those locations (which we do have now, and it’s great! ), and have all observations you make from that saved location all obscure to the exact same spot. That spot should be within an area that would allow it to still be visible on the proper local checklists, yet still retain privacy. If the user can pick the obscured spot or at least the encompassing places for the spot then they can ensure that. The current obscuring pushes half of my home observations outside of my county so that they don’t show up in searches or lists for it anyways. Let the user also set the publicly visible label for the saved place to something they are comfortable with, but that is still descriptive like “Username’s Home, Town, State, Country”. That would do away with the giant rectangle of hundreds of obscured observation markings blocking out large areas of the map over active users’ homes like mine and many other users I’ve seen. I don’t really see the point of that, unless it is to just indicate lots of observations in the area. The markers let you know that they aren’t actual locations anyways, so what is the purpose of having it look like buckshot on the map. This could work well with the automatic geofencing privacy as well. Set-up a home area boundary and give it a private and public label. You can either let the gps put observations in that place or select it manually. Any observations you submit for that place are visible to you with the actual location and your custom private label like it works now. Other people would see all those observations as someplace nearby all at one point where they can be included in the correct public lists, and not obscure the map for other purposes. There could even be a different icon for displaying many aggregated observations for these places in searches or species page maps and such. It could have an icon flyout for it that just says something like “User’s obscured spot with 85 monarch butterfly observations”.